Millersburg, PA – December 18, 2012 – Millersburg Borough has received a pair of grants to construct the next segment of the Lykens Valley Rail Trail. The borough was awarded $107,800 from the Community Conservation Partnership Program, administered by Pennsylvania’s Department of Conservation and Natural Resources (DCNR). The borough also received a Dauphin County Local Share Municipal Grant in the amount of $100,000. Also known as a Gaming Grant, these funds are generated by revenue from the state-licensed casinos. These grants are available to municipalities and nonprofit organizations in Dauphin County due the presence of Hollywood Casino in East Hanover Township. These funds will be used to improve the hiking and biking trail along the old rail bed in Upper Paxton Township adjacent to Berry’s Mountain. Plans call for upgrades to drainage infrastructure and the rail surface between Goodling Road and Woodside Station Road. The borough will work closely with the Ned Smith Center for Nature and Art as this trail is a pivotal part of the Center’s extensive trail network. Additionally, plans are being developed to connect the new trail segment to the path in Riverfront Park, which was built as a “gateway” to the greater Lykens Valley Rail Trail (LVRT). This effort will effectively extend the western end of the LVRT from the Susquehanna River to Woodside Station Road, bringing trail users through the center of the Millersburg Business District. Currently, in addition to the portion in Millersburg’s Riverfront Park, there are three completed miles on the eastern end of the LVRT extending from Wiconisco through Lykens. Once fully constructed, the Lykens Valley Rail Trail will extend twenty miles from Millersburg to Williamstown. “Other similar length rail trails in Pennsylvania add millions of dollars annually to their local economies due to the money spent by trail users. This is our goal for the Lykens Valley,” said Dietz. Although the outcome wasn’t what we had hoped for I am extremely thankful for your heartfelt dedication and support over the last year. Your support throughout this race has been a very encouraging and humbling experience. The campaign made over 25 thousand attempts to contact voters. All of that could not have been accomplished without your help! 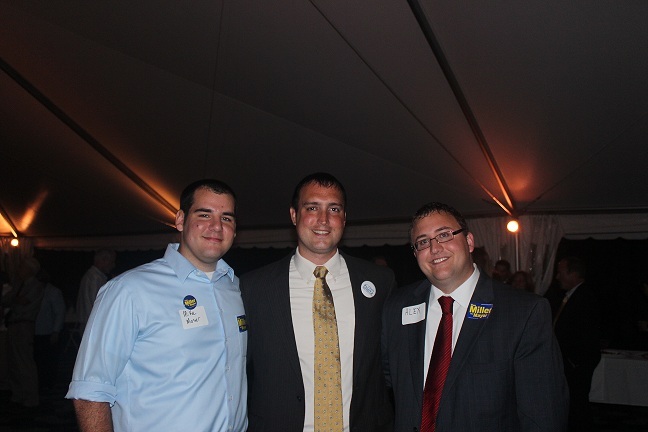 It was my honor to champion jobs, government reform, quality education, equality, and conservation! Together we have moved the bar forward. I am proud of the network that we have assembled in the 104 th district and I know that we will continue to work together to build a better and brighter future for not only Central PA but for the Commonwealth as well. I would like to specifically thank Mike Moser for being the best campaign manager and for keeping everything on track, including me the candidate. He has done a great job here and I look forward to watching him succeed in the future. I would also like to thank my immediate family for having my back and believing in me throughout the campaign: Alex Reber – Duane and Linda Dietz – Megan and Kevin, Ephraim, Joel, and Caleb Langdon – Holly Reber-Billings and Dan Billings – Chief (my cat). 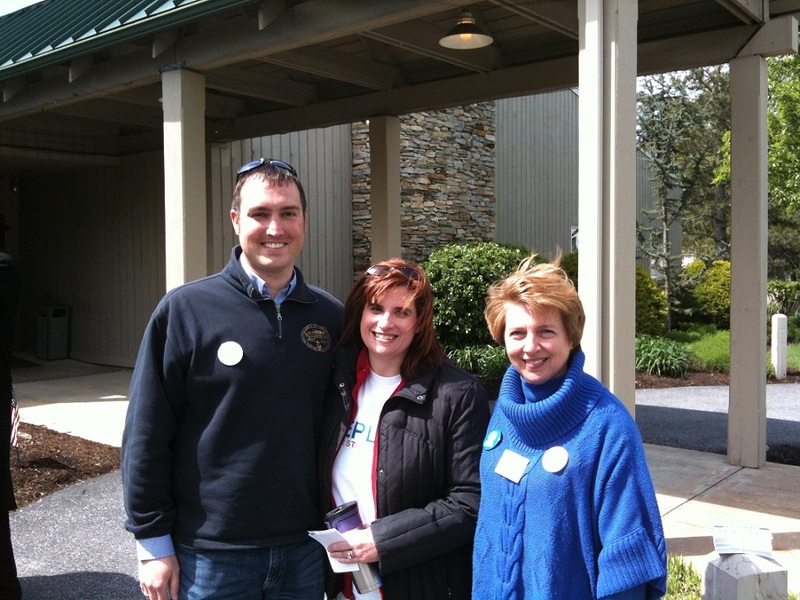 My Campaign Chairwoman, Diane Bowman and Campaign Treasurer, Harriet Boyer, and Field Director, Shamaine Daniels have been there every step of the way. Thanks for your dedication. Our team from all of the people and groups that endorsed me, to our volunteers, to those that contributed financially have been so generous. This campaign has been one of the best experiences of my life. P.S.-If you see a yard sign along side of the road that hasn’t been picked up please collect it for us so that we don’t litter the roadside. 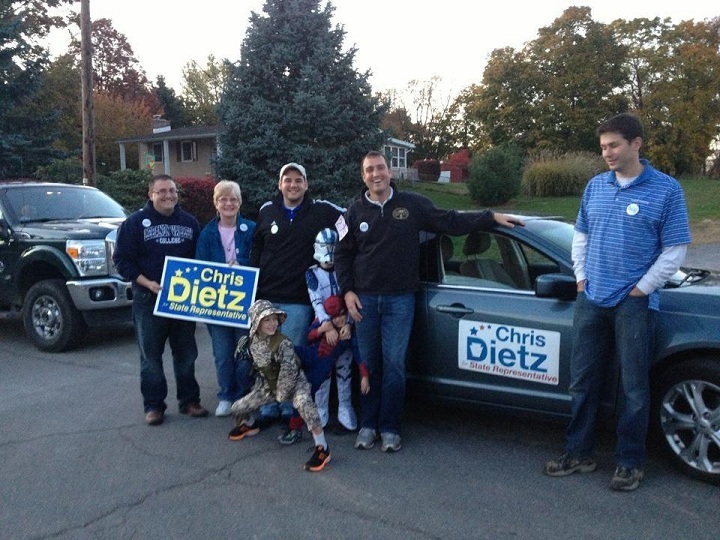 Please contact me by cell 717.319.1749 or Chris@VoteDietz.com so that I can pick them up! Also, below are photos taken throughout the duration of the campaign. Thanks again! 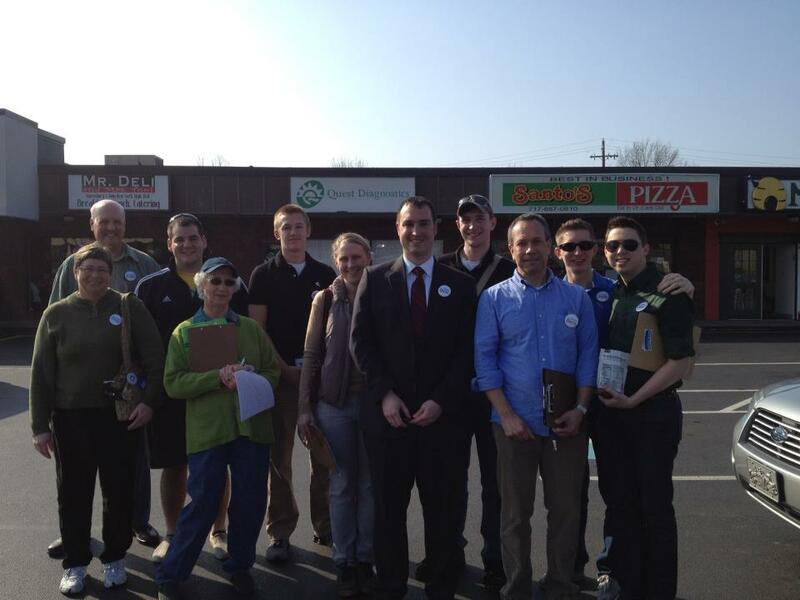 We are two days away from Election Day and had a great GOTV weekend! Thank You to everyone that joined in our efforts. We can use your help on Election Day. Please call Mike at 610-781-9110 for more information. 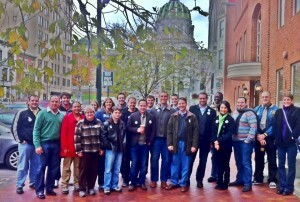 Join us at the Midtown Scholar Book Store at 1302 North Third Street in Harrisburg to watch the election results. We will be there beginning at 8pm. I am thrilled to announce my campaign’s endorsement by The Patriot News and The Paxton Herald! The Paxton Herald highlights my service on Millersburg Borough Council and my willingness to do the necessary research when developing new house bills. Rep. Helm admits cutting education funding – I plan to work to restore those cuts. Special thanks to The Rick Smith Show-Where Working People Come to Talk for the audio of my interview last night. “[School officials] believe the funding problems are affecting student achievement, including the lower results of the Pennsylvania System of School Assessment tests given in the spring. 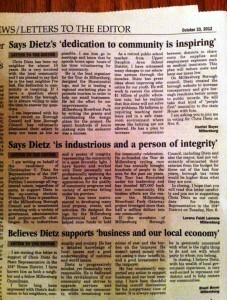 Three pro-Dietz letters to the editor were printed in my home town newspaper, the Upper Dauphin Sentinel, this week! Thank you Harriet, Lorena, and Brent! 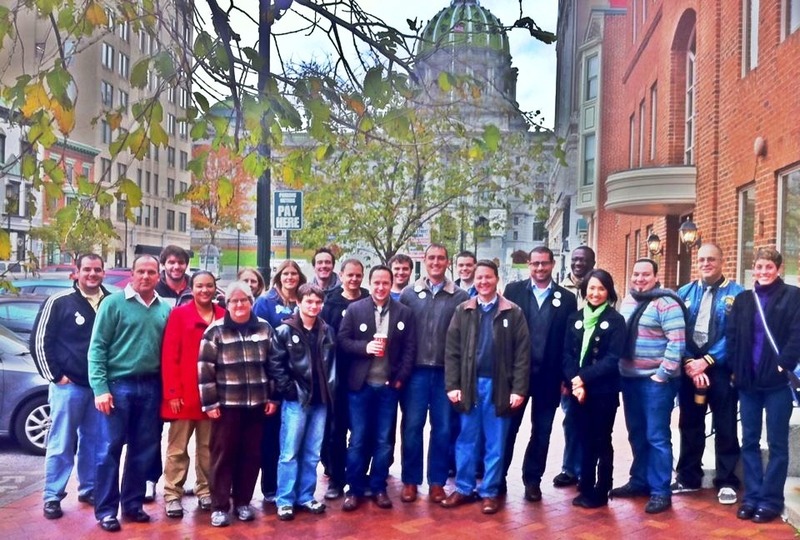 Harrisburg, PA – Today, Conservation Voters of Pennsylvania (CVPA), which works to turn environmental values into Pennsylvania priorities, announced its endorsement of Chris Dietz for State Representative in District 104. 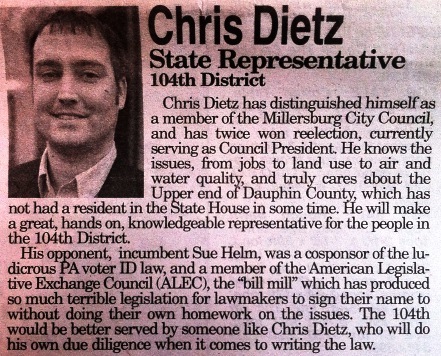 Dietz has challenged incumbent Representative Sue Helm, who failed to serve the interests of her constituents on the crucial issue of Marcellus Shale drilling. Helm earned a 23% score on CVPA’s 2012 Marcellus Shale Scorecard, voting three times to lower gas company taxes and in favor of state budget cuts to education, health and environmental protection. In voting for Act 13, Helm took away the right of local communities to decide if pipelines and other potentially dangerous gas facilities can be built near schools, hospitals and homes. 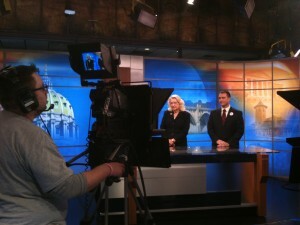 This candidate discussion aired on WGAL during the Friday News at Noon on October 19th. Pay close attention to Rep. Helm as she talks about cutting funding for our schools. She states that there really were no cuts to public education, because they restored the cuts. The truth is that we have millions of dollars missing from K thru 12 classrooms across the 104th district. The nearly $1 billion cut from public education has increased our property taxes and cut education opportunities for our children in both K thru 12 and in our system of State Colleges and Universities. “I will support our seniors by organizing Fairs that bring together many agencies related to retirees, including medical, housing, transportation, legal, and veterans’. I will work with our faith based community to network available services and grow into areas that are currently under served,” stated Chris Dietz, Candidate for State Representative in the 104th District.